A machine that can play pretty much every audio and video disc format for a mere £400, there's got to be a catch? Cambridge Audio is renowned for bringing competitive products to market, but to offer so many audio and visual features for so little is ambitious by any one's standards. 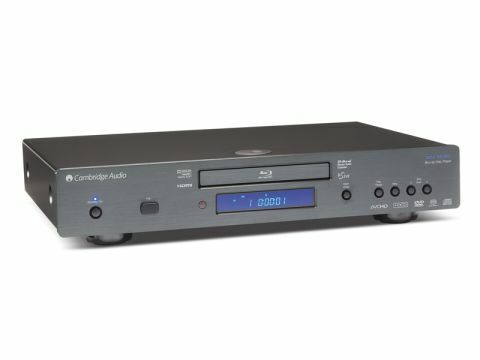 The Azur 650BD can handle CD, SACD and the late-lamented DVD-A, as well as HDCD encoded CDs, DVDs and the video format of the moment Blu-ray (BD). Naturally it will also decode all the latest surround formats (including the lossless ones) that are of most interest to us; Dolby True HD and DTS-HD Master. It is also up to speed with the latest features of BD, such as BD Live – there is an Ethernet socket to connect to a router – and BD+. So even if you're a die-hard audio fan, you can sample the delights of HD video, too. Analogue outputs extend to 7.1 channels, but there isn't a dedicated stereo output, while digital output can be found on optical, electrical and HDMI connectors. You can select the sampling rate of the former two right up to 192k, which is useful if you have a DAC that can take advantage. The player has onboard 24-bit/192kHz converters and a Pure Audio mode that switches off all displays, but the player turns them back on if you change discs. The standard of build is pretty much as good as it gets at this price. The front panel is a nicely finished slab of aluminium and the wrap around casework has a nice touch with the Cambridge logo stamped on top. The steel wrap is damped to minimise resonance, which is also a nice touch at the price. The remote is a navigator variant on the usual Cambridge handset albeit with rather small legends on the buttons. In value terms, the 650BD virtually has the field to itself, the only competitor to come close is the Oppo BDP83 at £600, but that's only available online and doesn't have UK distribution and back up. The alternatives from Marantz and Denon cost five times as much and upwards. This will change, but as things stand the Cambridge looks like great value. What, you might ask, do all these features do for the key music format, CD? It sounds a little on the thin side by the standard of dedicated players at this point, a Rotel RCD-06 brings useful extra detail alongside a fuller overall sonic picture. But on its own terms it can deliver reasonable energy levels and is as good at timing as most of the competition. But the 650BD is more than a CD player. SACD, for example, is rather impressive with fulsome but taut bass, solid imaging and a real spring its step. It's still a little short on density of detail, but it gets the musical message across well – be it the intensity of Steve Marriott's vocals or the funk in his rhythm section's bass line. BD is also good considering this is a £400 do-everything player, especially with good discs, offering an ease and spaciousness that puts it in the same league as pure audio formats. We also enjoyed some of our dusty DVD-A collection, a bygone format perhaps, but one which this player knows how make a good fist of. The Azur 650BD works on two levels: it's a play-everything machine that can form the centre of a starter hi-fi or a pretty decent home cinema, but if you hook it up to a decent DAC it is a universal transport at a bargain price. Until the big boys start making something to compete, it's impossible not to recommend it.